• Authors: Matthias Gritschneder et al. The physical processes that chemically enriched and possibly triggered the formation of our solar system have remained an unanswered question in astrophysics. The measured abundances of short-lived radioactive elements, such as the radio nuclide Aluminum-26 (26Al) which decays into Magnesium-26 (26Mg) and has a half-life of only 0.72 million years, found in meteorites place tight constraints on the time-scale for the formation of our Solar System. These radioactive isotopes are distributed uniformly throughout our Solar System and are commonly found in calcium-aluminum-rich inclusions (CAIs) in meteorites, suggesting that these CAIs had to form before all of the 26Al decayed. Furthermore, the inferred abundances of these isotopes suggest that the CAIs had to form within a short time span of approximately 20,000 years. This suggests that the formation of the Solar System must have been relatively quick, and that these isotopes were uniformly mixed in the young Solar System material. Several theories of how the solar nebula was enriched with these elements have emerged over the years. These include external enrichment from the winds of nearby Asymptotic Giant Branch (AGB) stars or Wolf-Rayet stars, or internal enrichment by solar energetic irradiation of dust and gas near the proto-sun. However, these scenarios would require that the solar nebula be continuously enriched for a longer period than the ~20,000 year formation episode of CAIs, and produce abundances inconsistent with the observationally inferred abundances of 26Al and 26Mg. The authors of this article explore a possible solution for obtaining the correct time scale for the CAI formation epoch: external enrichment from a supernova explosion that would also trigger and drive the collapse of the pre-solar cloud core. In this scenario, the infalling gas could be heated to a temperature above the condensation temperature of the CAIs and then cool over the next 20,000 years. The subsequent growth of CAIs would be possible on such a short time-scale in the proto-planetary disk. The authors perform 2D hydrodynamical simulations to determine if the ejecta from a nearby supernova could chemically enrich, uniformly mix, and trigger the collapse of the pre-solar cloud core. They start by assuming that this core has a mass of 10 solar masses and a radius of 0.21 pc, and that the supernova ejecta – containing enough 26Al to validate the inferred abundances in CAIs – is either spread out uniformly within the explosion bubble or distributed along a thin shell on its border. The authors consider supernovae explosions that occur at locations of 5 and 10 pc from the pre-solar core, and consider two different progenitors with masses of 20 and 40 solar masses. In these scenarios, it takes ~8.5 kyrs (5 pc) and ~48.2 kyrs (10 pc) for the blast wave to reach the pre-solar core. The time evolution of the density of the pre-solar clump when the shock wave of a supernova located 5 pc away intersects it. These snapshots show the density distribution at t = 0 kyr, t = 4.16 kyr, and t = 8.33 kyr. The length scale is given in units of the initial core radius (R = 0.21 pc). The figure to the left shows the time evolution of density in the simulation when the supernova explosion occurs at 5 pc away from the pre-solar core. The supernova shockwave is propagating from the bottom to the top and encompasses the pre-solar core, deforming the core very rapidly. The part of the front that hits the clump wraps around the core, mixing in the supernova material homogeneously, and drives collapse. The authors find that in both cases, whether the supernova ejecta material is distributed uniformly in the explosion bubble or along a thin shell for the 40 solar mass progenitor, the chemical content of the gas phase of the core is sufficiently enriched to allow for the formation of the observed CAIs. However, the best results occur when the material is distributed along a thin shell encompassing the explosion bubble. The densest regions of the post-shock core will undergo gravitational collapse. 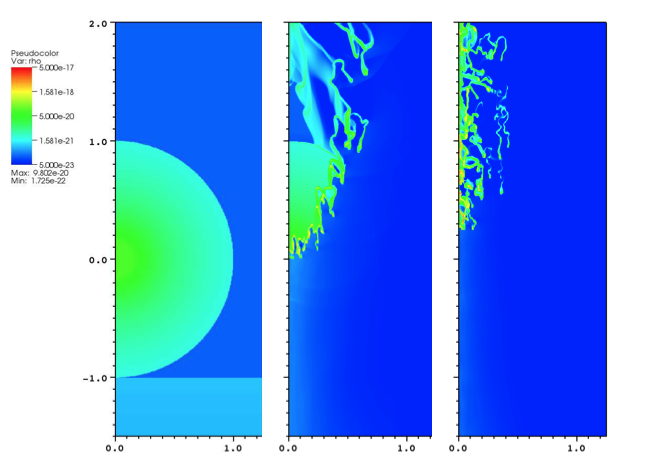 Next, the authors perform the same simulations but place the cloud core 10 pc away from the supernova explosion. Since the distance between the supernova and cloud core has increased, the angular cross section is much smaller and the enriched material is much more dispersed than the previous scenario. The authors find that at late times (t=14.6 kyr) the cloud core is much less deformed than the previous case. 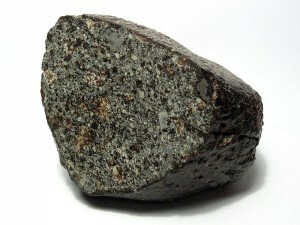 They also find that the core will not be strongly enriched, even though the material will still mix efficiently. The authors conclude that a supernova located this far away is unable to chemically enrich and trigger the formation of our Solar System. In summary, the authors find that a supernova explosion located approximately 5 pc away from the pre-solar core would be sufficient to chemically enrich the core with enough 26Al to match current observations as well as drive the collapse of the cold pre-solar core on a sufficiently fast timescale. An explosion twice as far away would be unable to sufficiently enrich the core and drive collapse. They also find that the collapsing core can be sufficiently enriched with these short lived radioactive iostopes even if the enriched material is uniformly mixed within the entire supernova bubble.